Scium Basci Tesfalidet Ghidai: Polizia Africana Italiana, Asmara, Eritrea. A sergeant in the Police Force formed by the Italians, 1940-44. Top. Brighton Pier, linocut, 1958. 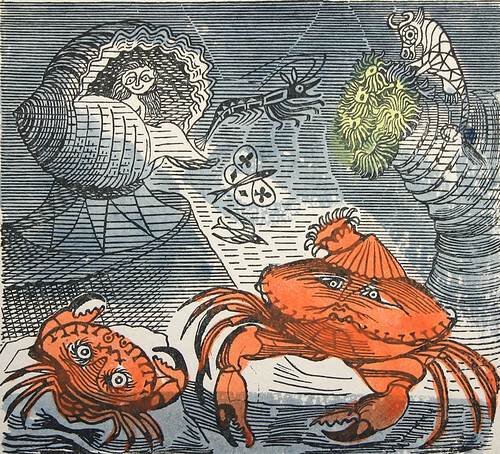 Some of Bawden’s works on display may be familiar, others less so. 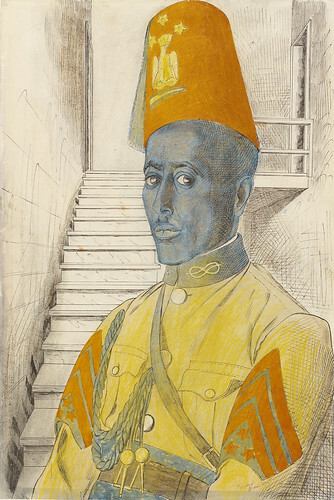 In addition to a wide selection of the commercial material for which the artist is known and some stunning linocuts, the exhibition also shows a selection of his prewar watercolours and several impressive wartime portraits in North Africa and the Middle East. The show is curated by James Russell and its captioning is pleasingly clear and straightforward. Russell has also written the sumptuous accompanying catalogue Edward Bawden (Philip Wilson Publishers, £25). Designed by Lucy Morton at Illuminati, the book is divided into six major sections, including ‘World off Duty’, ‘Spirit of Place’ and ‘Fable and Fantasy’, and its large format and sharp printing enables the illustrations to be shown clearly, giving the reader the opportunity to pore over all the many, often tiny, funny or decorative details. An Old Crab and a Young, ca. 1958. If your appetite for all things Bawden is whetted by this substantial exhibition and book, consider heading a little further afield to The Fry Art Gallery in Saffron Walden in Essex, where another show, Bawden At Home (1 April–28 October 2018) is displaying over 200 of his artworks and other items. The accompanying book for this exhibition, Edward Bawden At Home, A Working Life (Random Spectacular, £17.95), shows over 50 images of prints, paintings and wallpapers designs, as well as photographs of his Saffron Walden home, taken by Roy Hammans in 1989, shortly after the artist’s death. Essays by Iris Weaver, Richard Bawden (the artist’s son), Peyton Skipwith (the executor of Bawden’s estate) and Christopher Brown provide anecdotes and insights. 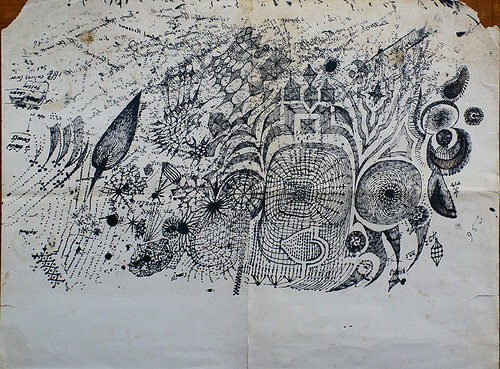 Gardening with Mr Bawden by Kate Farley (Design for Today). 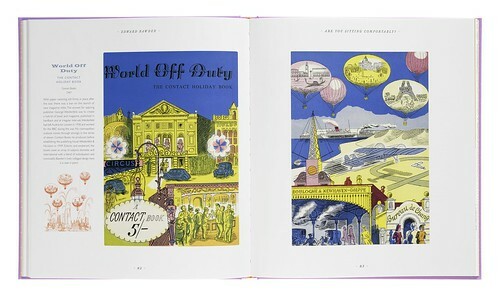 Two more, very different, Bawden books are also published this year. 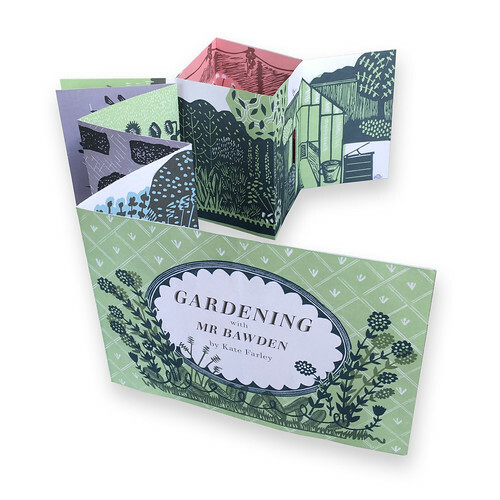 The first, Gardening With Mr Bawden by Kate Farley (Design For Today, £9.95) is an homage to both Bawden’s illustrations and to his love of gardens in the form of a charming wordless mini book of layered linocuts that create a fold-out scene. The second, Are You Sitting Comfortably? The Book Jackets of Edward Bawden (Mainstone Press, £35) is a much more heavyweight title, both physically and in terms of its content. Bawden worked with many of the leading publishers of the twentieth century and this book features more than 100 book jackets and illustrations by the artist. It also includes an essay by Peyton Skipwith and captions by James Russell. Cover of Are You Sitting Comfortably? Design Webb & Webb, 2018. Spread from Are You Sitting Comfortably? In 2016, both the Edward Bawden Scrapbooks by Peyton Skipwith & Brian Webb (Lund Humphries, £40) and Edward Bawden Design (ACC Art Books, £14.95) were published. The former, another large format book, shows extracts from five of the artist’s scrapbooks assembled over 55 years (see ‘Friendships and glue’ on the Eye blog), while the latter, written by Brian Webb and Peyton Skipwith, is a smaller book on Bawden’s life and work. This has the big advantage of fitting easily in a bag, so is a great option if you’re reading on a journey. There is also a fleeting, six-day exhibition, ‘Standing A Little Outside Life Edward Bawden’ (18-23 June), at Morley Gallery, South London, which includes work by both Bawden and contemporary artists, including Ian Beck, Chloë Cheese and David Gentleman. Back in 2014, Morley College held the exhibition ‘Edward Bawden Storyteller’, and the book that accompanied this exhibition is worth reading, too. With essays by Nick Rampley, Peyton Skipwith, Elaine Andrews and Alan Powers, it not only tells the story of the 1930s Morley College murals – created jointly by Edward Bawden and Eric Ravilious before being destroyed in the Second World War – but also of Bawden’s later 1950s Canterbury Tales murals for Morley and other work. Finally, to honour both Edward Bawden and Eric Ravilious, why not have a bit of fun cutting out and assembling Brick House, by Alice Pattullo (Design For Today, £14.95)? It’s a paper fold-out model of the house in Great Bardfield in which Bawden and his wife Charlotte spent much of their lives, and which was briefly shared in the 1930s by Ravilious and his wife Tirzah – herself an impressive illustrator, as shown in Andy Friend’s touring exhibition, ‘Ravilious & Co: The Pattern of Friendship’. For more information on that exhibition see ‘The Crew with no name’ in Eye 95 and also Long Live Great Bardfield: The Autobiography of Tirzah Garwood (Persephone Books, £13). * ‘Edward Bawden: Art and Design’, Dulwich Picture Gallery, Friday 13 July 2018, 6-10pm £12 / £10. This features a presentation by artist / print-maker Alex Booker followed by a panel with Andrea Tanner (archivist at Fortnum & Mason), Bawden curator James Russell and artist Chloë Cheese, who knew Bawden well, chaired by Eye editor John L. Walters. The Eye event will be in the Linbury Room from 7-9pm and the tickets grant after-hours access to the Bawden exhibition, the Gallery and its grounds and many other fun activities as part of the DPG ‘gallery late’ event ‘By The Seaside’. 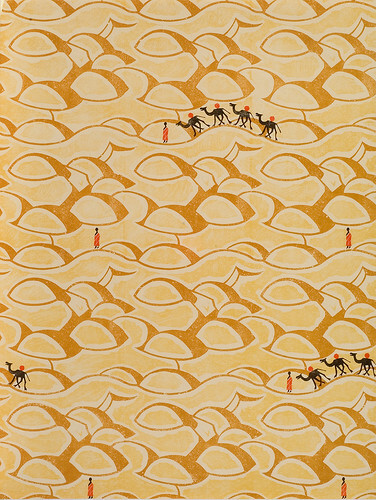 Eye is media partner of ‘Edward Bawden’, Dulwich Picture Gallery, London SE21 7AD. 23 May–9 Sept 2018.
Review of ‘Ravilious and Friends’ in Eye 95.